This bird toy was especially made for my African Grey Jerry who loves to chew wood and preen Supreme Cotton Rope. He also loves to dig in and find the hidden plastic chewable letters. 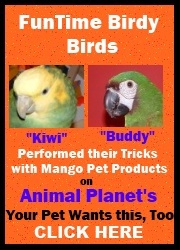 The combination of the three is a layered delight for your feathered friend. After watching Jerry enjoy this toy so much my Amazon Kiwi and my Severe Macaw Buddy wanted one of their own. Parrot toy includes 20 jumbo popsicles, assorted pine wood blocks, large plastic alphabet letters and 5 feet of supreme cotton rope. Parrot toy measures 16" long and 6" wide. 4 Tier Layer Cake Amazon/African Grey Bird Toy5Diana S.March 29, 2016My CAG loves playing with this one...she began by destroying all the sticks, and is now working on chewing the larger blocks. She was very reluctant to play with her new toys at first, so seeing her begin to chew this one is very exciting!! 4 Tier Layer Cake Amazon/African Grey Bird Toy5Autumn PettitOctober 9, 2011My birds loved destroying this. They relish all of Ann's toys and can't wait until they can mutilate them:) thanks Ann! 4 Tier Layer Cake Amazon/African Grey Bird Toy5Gayle SchwartzJanuary 14, 2011Very durable toy. Our birds loves this toy. Many hours of enjoyment.